Windows may show you Error 0x8024402f in Windows 10 Whenever you try to Download and install new Updates. This Error might be caused because of your Internet Connection or Firewall Settings which is Causing Problems Connecting your PC and Microsoft's Server. This Error Stops your from Downloading New and Latest Updates that Microsoft Releases. We are Covering this error for Windows 10 only but might just help you if you are getting Windows Update Error 0x8024402f in Windows 8 or 7. Lets see how to fix this. 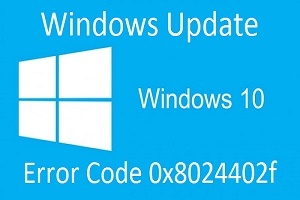 We will be discussing some Generic fixes for this issue first and then jump to Advance Method to get rid of this Windows Update Error Code 0x8024402f. We will see 2 generic methods listed under Basic Steps and 1 advance method to fix this issue on your Windows 10 PC. if you are Unable to Download Updates in Windows 10, then first thing you want to do is Check your Internet/Network Problems. Thankfully there is a utility program inbuilt in Windows 10 to Identify any problems in your Network and Fix them. So do the following. Search for "Identify and Repair Network Problems"
It should automatically Start Identifying. If your network has any issue then it will show you and ask you to fix it. If not then you are sure that you Internet is not the issue. Move on the Next Step. if you have some Anti-malware or Anti-Virus on your Windows 10 PC, then it might Turn of Windows Firewall on its own or Make their own Firewall as Default. So if this is the case, you will need to Turn on Windows Firewall. Click on Windows Firewall (Control Panel). On the left pane, Click on Turn Windows firewall ON or OFF. Click on Turn on Windows Firewall then Click Ok.
That is it, Now Try again and see if you are still getting Windows Update Error 0x8024402f in your Windows 10. If this Doesn't help then check the below Advance Method that most of the time works to fix this issue. If both of the Above Steps failed then you might surely want to try this method which is Enabling ActiveX in your Router Firewall settings. If you had turned off ActiveX in your Router Firewall settings then this must be the culprit and so Error 0x8024402f is shown whenever you try to get Windows Update. All you need to do is Enable ActiveX by Going to your Router Firewall Settings and you should be good to go. The Error should be gone for good now and you will be easily able to Install the Updates in your Windows 10. Once the Error is Fixed, You might want to Stay away from this and many other errors too. We Recommend you to Use Total System Care Program which will keep your Computer System Healthy and Error Free. If any of the above method helps you, then please let us know in Comments, Helps Us and Others too. Router & firewall: no ActivX settings found. Network: Advanced System Care 9 & Tweaking.com Windows Repair. Clean Boot; shut down ASC, MalwareFigher, Immunet3. i try this steps on PC but still doesnt run. All time win update write me error 0x8024402f. i dont know how to rix it please help me.